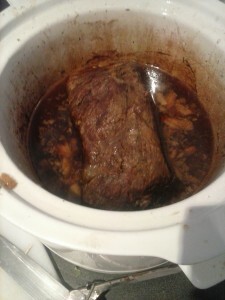 I made slow cooker roast beef today and it was so tender! I have a habit of overcooking beef when I roast it in the oven, so though I would try this method. I found it simple and quick to prepare and fantastic in results. And the great thing is, because it is slow cooked you can use cheaper cuts of meat and still get tender results. -Get out your meat when ready to eat at the end of the day! *I also fried up some mushrooms and reduced the stock and meat juices from the slow cooker until it make a very yummy sauce.